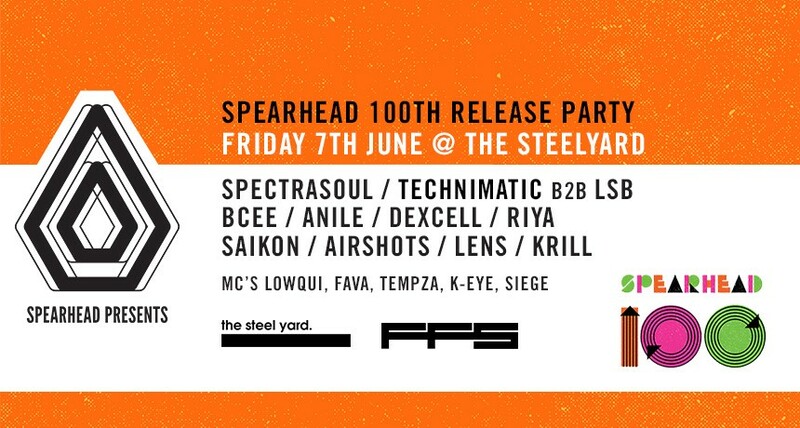 Spearhead Records are proud to announce that they will be returning back to London on 7th June to celebrate their Spearhead 100th release party! They’re combining heavyweight names with new faces from the scene, bringing together established talents like Spectrasoul, BCee and our Special Guest Technimatic who plays B2B with LSB in one of London’s most acclaimed venues – The Steel Yard. Having remixed Dexcell’s track ‘Without You’ last year, Anile joins the line-up with Dexcell himself, alongside versatile DnB producer Riya. Saikon, Lens and Krill complete the bill with LowQui, Fava, Tempza, K-Eye, Siege on MC duties. The last few events have sold out in advance and we expect this one to do the same and as always, we’ll be providing our unique brand of Drum & Bass with a vibe that’s second to none.